Ayșe Muñiz, a senior in biochemistry from Alamogordo, N.M., will soon be leaving the sunny state of New Mexico she’s always called home for the northern frontiers of Michigan. 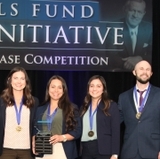 Muñiz is one of the recipients of the National Science Foundation’s Graduate Research Fellowship Program award, which recognizes and supports outstanding students in NSF-supported science, technology, engineering, and mathematics disciplines who are pursuing research-based graduate study. She will attend the University of Michigan - Ann Arbor, where she will be pursuing a Ph.D. in the macromolecular science and engineering program. 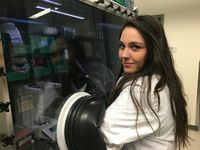 At the University of Michigan, Muñiz has the chance to serve on a one-year laboratory rotation, which will give her a taste of different types of lab work. The NSF fellowship will not only fund her tuition and provide a stipend during her graduate studies, but it will provide access to databases and supercomputers, as well as valuable networking opportunities. In addition to the NSF fellowship, Muñiz also is receiving the University of Michigan Rackham Merit Fellowship, which will cover two additional years of funding. Ayse Muniz working in laboratory. Muñiz said she is looking forward to using her knowledge to solving challenges in the medical field and feels that she received excellent training at UNM, first through the chemical engineering program, then switching to the biochemistry program. 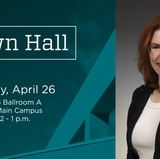 She also worked in the laboratory of Jeffrey Brinker, who holds a joint appointment at Sandia National Laboratories and as a UNM distinguished professor of chemical and biological engineering and molecular genetics and microbiology, as well as being a member of the UNM Cancer Center. Muñiz said she feels well-prepared to tackle graduate school and a career after having had so much opportunity at UNM, both in research resources and in personal interactions. 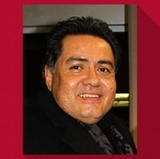 “One aspect of UNM that was incredibly important was the individual attention I received in the lab and outside of it. My reviewers stated the importance of my letters of recommendation. They mentioned how they were personal and provided a holistic view of my potential as a researcher,” she said. 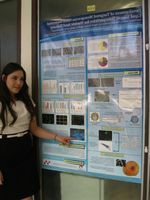 Ayse Muniz in 2015 presenting a poster for Biology Research Day. Muñiz said it’s too early to tell which direction an eventual career might take, but she is looking forward to exploring many options through her fellowship opportunity in Michigan. “I hope to develop a broad enough skillset that can be applied to solving many of our society’s challenges. Right now my interests range from gene therapy to astrobiology. I am currently looking at a biosensor project for my Ph.D. with one of the professors at Michigan,” she said. 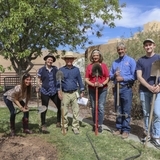 Muñiz credits not just her hard work for her success, but also the network of support she has been able to receive from family and friends in the state, including her husband, Zackary Dodson, a senior in nuclear engineering at UNM, as well as siblings, parents and grandparents. Dodson was received an honorable mention in the NSF Graduate Research Fellowship Program. At Michigan, he will pursue a Ph.D. in nuclear engineering and will be working on modeling nuclear power reactors.